The Zambian encounter with foreign music frequently results in Zambian music losing out. But does the foreign music portray the experiences and reality of the Zambian situation? This is the question and challenge that John Nyirongo always posed to himself and strove to answer. Throughout his career, John displayed his skills as a balladeer. His songs are emotionally potent and entertaining. A mixture that is impossible to resist, a perfect accompaniment to a good time. The lyrics talk about basic family worries. These have an immediacy and relevance to the Zambian situation sucha that the image created is almost crystal clear. His sister Joyce helps sharpen the image with her powerful and versatile vocals. 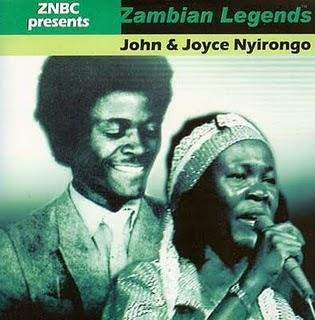 From 1985, Joyce his the limelight with blockbusters which were produced by her brother and proved very popular in Zambia. In 1986 she released Sala, then Sebe in 1988. Her final work was Succession in 1990. A tasty collection of musical songs that explore and extol the many kinds of love that exist between man and woman: drunken love, murderous love, gentle and contented love, love with money problems, married love and adulterous love. All played with jangling African guitars and all suited for dancing. I couldn't sleep from jetlag last night, so I had downloaded millions of music from your three blogs. I love this one, it's such happy music. the file is no longer available, is it possible to upload again? I just love the songs..
Half a Million Visits: Thanks everyone.